The Great Recession officially ended in 2009. But 2015 may go down as the year the recovery finally began for most Americans. The Census Bureau reported Tuesday that the median U.S. household made $56,516 in 2015, up 5.2 percent from 2014 after adjusting for inflation. That’s the first increase since 2007, and the largest one-year increase on record. The number of Americans living in poverty fell by 3.5 million, and the poverty rate fell 1.2 percentage points, to 13.5 percent, the biggest drop since 1968. The income gains were remarkably widespread. Incomes rose for people in every age group, of every race and in every part of the country. And in a reversal of recent trends, incomes rose fastest for the lowest earners. By most measures, in fact, the U.S. became slightly more equal in 2015. One year of strong gains wasn’t enough to erase the scars of the recession, though, or the years of weak income growth that preceded it. 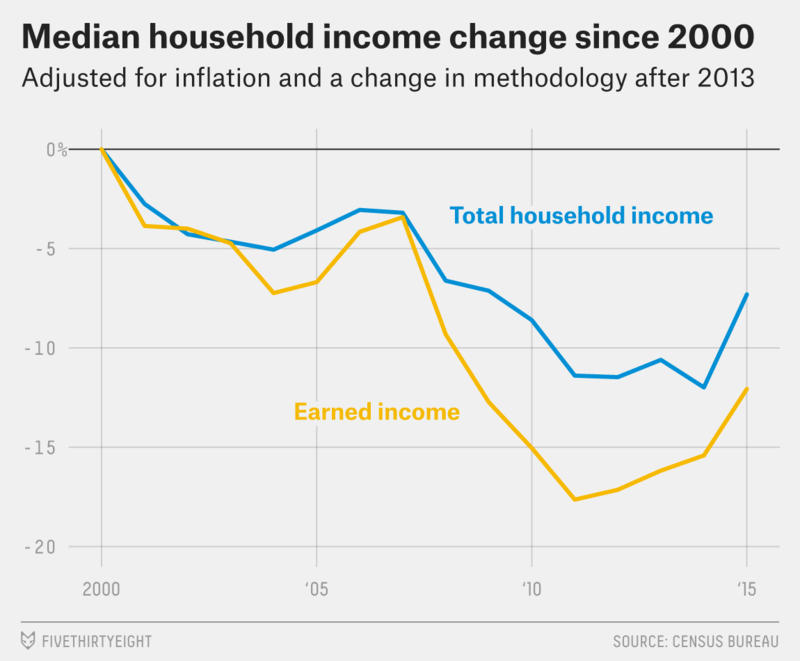 Incomes remain lower, and poverty higher, than they were when the recession began in late 2007. Worse, incomes have been stagnant, at best, since 2000, even accounting for trends such as the aging of the U.S. population. It is hard not to view Tuesday’s report through the lens of the 2016 campaign. Donald Trump has often referred to stagnant incomes as a sign that President Obama’s economic policies have failed; the new data may not lead Trump to shift his rhetoric, but it does suggest that the recovery has become significantly stronger in the final years of Obama’s term. The White House wasted no time in publishing a blog post boasting about the strong numbers. But beneath the headline-making recent gains revealed in the report, there was still plenty of less-positive news for Trump and his supporters to point to. 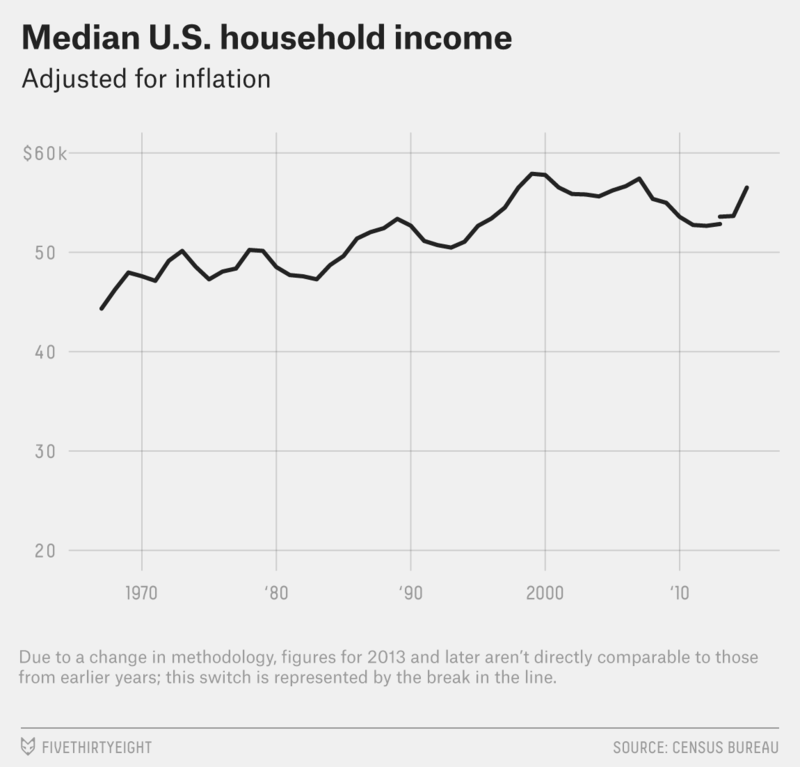 Despite the strong gains in 2015, incomes for the bottom 60 percent of U.S. households are still lower they were than in 2007. And rural America has been left out of the latest rebound: Households outside of metropolitan areas saw their incomes flatline or even decline in 2015. In other words, the job isn’t over. If 2015 marked the start of the recovery for household incomes, then it was a strong start — significantly stronger than expected by even optimistic economists. But the economic recovery is now more than seven years old, and economists are increasingly concerned about the possibility of another recession in the coming years. It will take several more years like 2015 to fill the gap left by the recession. Less poverty: Officially, 43 million Americans lived in poverty in 2015, including 14.5 million children under 18 and 4.2 million seniors ages 65 and up. But economists across the political spectrum consider those figures misleading because they are based on an outdated definition of poverty that ignores many necessary expenses (such as the cost of transportation and medical care) and fails to account for differences in the cost of living from one part of the country to another. The Census Bureau on Tuesday also released an alternative measure of poverty that does account for such factors; there were about 2 million more poor Americans under this so-called Supplemental Poverty Measure than under the official definition, but about 3 million fewer poor children. However you define it, poverty fell sharply in 2015. The official poverty rate, at 13.5 percent in 2015, is the lowest since 2008, although it is still a full percentage point higher than it was before the recession began. Government programs lifted millions of Americans out of poverty. Refundable tax credits such as the Earned Income Tax Credit boosted income above the poverty level for more than 9 million Americans, including nearly 5 million children; the Supplemental Nutrition Assistance Program, more commonly known as food stamps, reduced the number of Americans experiencing poverty by another 4.6 million. Gender wage gap narrows: The median woman with a full-time job earned about $41,000 in 2015, about $10,000 less than the median man. Women earned 80 percent as much as men, a slight (statistically insignificant) narrowing of the gender wage gap from 79 percent in 2014. This measure of the gender wage gap is crude, ignoring differences in education, occupation, hours worked and other factors. 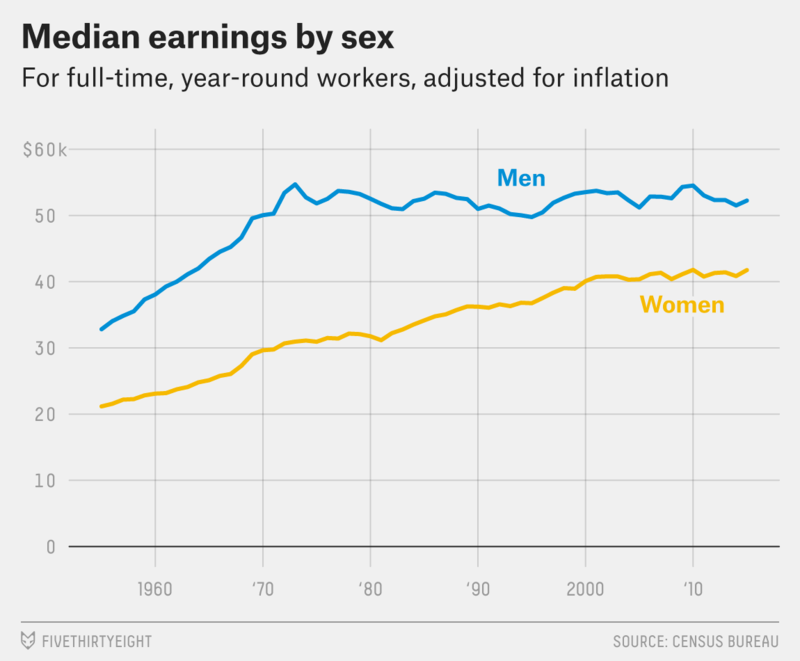 For men and women working in comparable jobs, the gap is significantly smaller. Still, the measure helps reflect the overall status of men and women in the U.S. economy; the gender wage gap shrank significantly in the 1980s and 1990s, but more recently, progress has stalled. The gains haven’t been equally shared, however. States that chose to expand access to Medicaid under the new health care law have seen substantially greater improvements in their insurance rates than states that did not. Kentucky, for example, which has won widespread attention for its embrace of Obamacare, has seen its uninsurance rate fall 8.3 percentage points since 2013, to 6 percent. South Dakota, which didn’t expand Medicaid, has seen just a 1.1 percentage point decline in its uninsurance rate, which remains above 10 percent. In 2013, the Census Bureau changed its annual income survey to capture some income that didn’t get properly reported in the past. For 2013, it used both the old and new methodologies and published two separate sets of figures. That means the 2014 and 2015 numbers aren’t directly comparable to earlier figures. In the chart below, I adjusted the 2000-12 data to bring it into line with the new methodology. To do this, I took each component of income (wages, Social Security, interest, etc.) and compared the total amounts under the new and old methodologies for the 2013 data. I then used those ratios to adjust the earlier years. Note that this assumes that the relationship between the methodologies has been consistent over time; the further back in time we look, the less reliable that assumption will be. The new methodology had no statistically significant impact on wage and salary data, so I don’t adjust that data.